I am not going to argue that Obama’s economic policy is was good - but there is no reason for the bald-faced lies. Trump’s structural deficits caused by irresponsible tax cuts and no spending cuts will crush the economy in the long run. That is fake news - Obama did it (exceeded 3% growth in a quarter) 8 times. No he didn't and admitted so. He and his policies and regulations were terrible and killed our the economy which is why it was such a quick and easy fix for a conservative, principled businessman like Trump. The growth would even be better right now if "The Swamp (both sides of the aisle)" would have ditched ObamaCare! So when ObamaCare is finally trashed, and more tax cuts are put in place, the economy will skyrocket under Trump's Reaganesque policies. So save your money (or find ways to increase it without losing much) for now and wait to go on a buying spree soon after the crash hits. I am not worried about myself. I will be fine. How nice of to be concerned about the common folk. Talk about a family in need of some intense therapy. 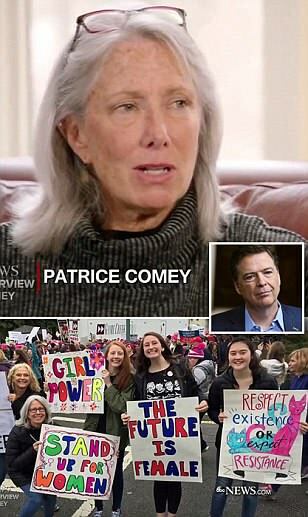 Former FBI Director James Comey's wife was a Hillary Clinton backer 'devastated' by her defeat and joined the women's march after President Trump's inauguration. Patrice Failor Comey appears in her husband's bombshell interview with ABC News, where she says she wanted a woman president 'badly.' James Comey says probably all five of his children wanted Clinton to become the first woman president. The network broadcast an image of Patrice and her daughters marching in Washington, D.C.
Well, they are only irresponsible because there are no spending cuts. Obama added 8.5 trillion dollars to the debt without cutting taxes, and Bush 2 added over 5 billion with tax cuts, so spending cuts seem to be in order here. Only someone with TDS would single out Trump, however. I sure heard a lot of crowing by the tribes in both houses of congress about how happy days were here again when he signed the bill they presented to him. Maybe you forgot about that part. Had he not signed it, you'd be here talking about how irresponsible he was for shutting down the government. I get it...you are the most tribal person on this board. I still think the whole tax structure is messed up because it discourages additional productivity. It punishes you for giving a s^%$. The whole income tax should be done away with for any worker making less than a million dollars a year. Tax should be on consumption (a sales tax is one way to collect it), and that way you are truly taxing wealth instead of work. Any parts imported from overseas should be considered a consumption of goods and taxed accordingly. Also, this way you at least collect some of the money from illegal immigrants that they cost us in spending. Social Security and Medicare should still be taxed, and distributed, based on earnings. No means testing. I didn’t single out Trump. I was here criticizing Obama too. Then you and I agree here. The original Tea Party folks rode a wave to DC talking about this kind of stuff, and they were attacked by the dems, repubs and media savagely. Such a sickness still be exhibited by the hating and liberal left. Last year, all 10 Democrats on the committee voted "no" to Rex Tillerson's nomination, making him the first secretary of state in history to be approved on a party-line vote. Now, thanks to the opposition from those 10 Democrats and Paul, it appears that Pompeo could soon become the first secretary of state nominee in history to receive a negative recommendation from the committee.There is simply no excuse for this. There are no ethical questions hanging over Pompeo's nomination. He has engaged in no disqualifying personal conduct. And no one questions that he is extraordinarily qualified for the job. Indeed, Sen. Ben Cardin, D-Md., said that Pompeo "has a clear record of public service to his nation -- in uniform, in Congress, and as the director of the CIA." Sen. Chris Murphy, D-Conn., said he believes that Pompeo "will work hard to restore morale at State and work to supplement, not atrophy, the diplomatic tools at the Secretary of State's disposal." Yet both are voting against him. Indeed, nine of the committee's 10 Democrats have already declared their opposition to Pompeo -- including two, Tim Kaine, D-Va., and Jeanne Shaheen, D-N.H., -- who voted for him to lead the CIA.